I had booked a room in a hotel for two days in Füssen using booking.com. I provided a password protected visa debit card. I cancelled my accommodation within two days due to change of plans. I received a mail from the hotel reception that I would have to pay 99€ as cancellation fee. They could not charge my card as it could not be validated. They threatened me that they would take legal action if I don't pay! I have never heard such rude reply from European hotels for such a case. Change of plans can happen any time. But 99€ cancellation fee is too high for a two day booking in small guest-house in Füssen. (It is 90% of the total booking amount.) Can they really take legal action for 99€ if I don't pay? Had I provided a credit card and they charged as much money as they could from my card and then also booked the room - they are always benefited! BTW I cancelled the room 11 days in advance. Is it necessary to pay the hotel? If you thought the cancellation fee was too high, why did you agree to it? The hotel may well be entitled to take action to recover the debt you owe it; that would depend on the detail of the local law and the conditions of the contract you have. If you are interested in that, please do go over to law.stackexchange.com for a fuller discussion. Whether the hotel will bother over 99 euros is a different matter, particularly if you are domiciled abroad. A high cancellation fee is not unusual for a hotel. A guest who cancels a reservation with only eleven days notice represents a real loss to the hotel, unless the hotel can fill that room in the remaining time. The hotel has to protect itself against that possibility. For future reference, hotels are often happy to accept changes to dates on non-refundable reservations, even if they claim not to be. Sometimes the hotel will offer some rooms with free cancellation, and other rooms without. Sometimes they even offer the same rooms, one with "free" cancellation and the other without, but the one with "free" cancellation might cost more. You should be able to find the cancellation conditions if the room does not offer free cancellation. If it is not spelled out as free cancellation, you should assume it is not free. If it is not free, it is usually up to the hotel to specify how much the fee is. The only question is: Was the fee listed in the booking.com reservation? This is always included in the booking confirmation you receive by mail. Please check it there. If the fee is there, then you are obliged to pay it. You can of course refuse, but I don't think that this is a good idea. It's clearly non-ethical and it can lead into troubles. If the fee is not there, you should not pay it. Rather you should contact booking.com directly and report the issue to them. While this does not happen in Germany usually, it can happen in some places that the hotel just tries to get some money from you this way. Booking.com staff will let you know whether you need to do anything more; they do care about people being satisfied and they don't like cheating. 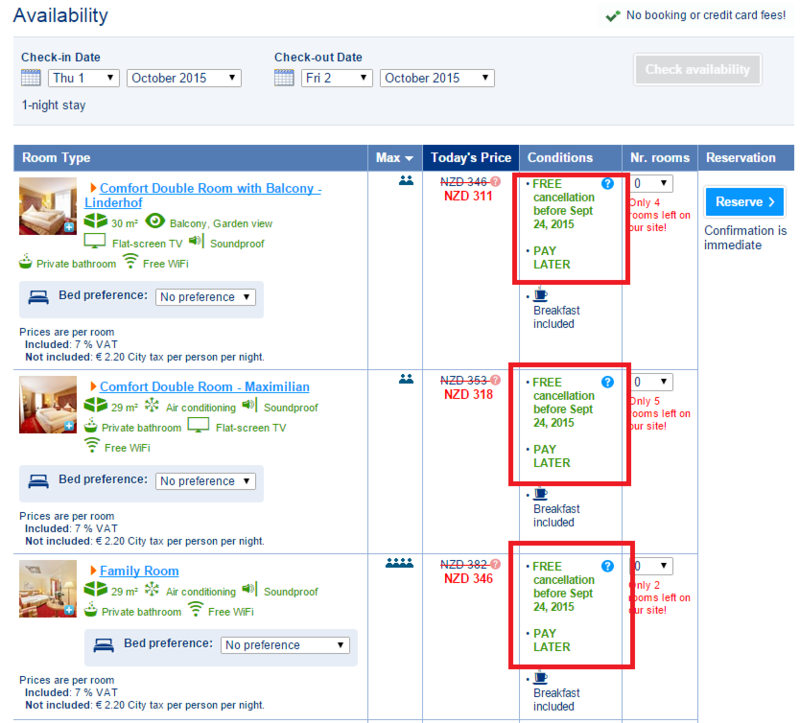 In my experience booking European hotels, it is often possible to select between different rates for the same room, with higher rates corresponding to more relaxed cancellation policies. This seems fair, since it lets you choose who bears the risk in the event of a change of travel plans. If you're certain you're going to be there, you can pay less; if you're not, you pay the hotel a bit more to help compensate for the chance that they won't be able to fill a room they expected income from. It may be that you had this option (and possibly didn't realize it) — or it may just be that this hotel always has a strict policy, which, really, allows them to offer lower rates overall because of that decreased risk. Either way, they are almost certainly within their rights now — you should pay them, and remember to read the fine print next time. As others have correctly stated, high cancellation fees are quite normal for non-refundable room rates and certainly will be stated in the terms you agreed to at booking. Many places will offer both (cheaper) non-refundable rates and (more expensive) refundable rates. The latter tend to be popular with business travelers whose plans tend to change more frequently, while the former tend to be more popular with tourists who tend to be more price-sensitive and whose plans tend to be somewhat less likely to change. My advice would be to check booking.com and try to find what terms you actually agreed to. If you can't find it on their website or in confirmation e-mails, etc., you might try calling or e-mailing them to get the terms. They should have records of your reservation and should be able to provide you with the terms. You can also check the local laws in Germany, as those would supersede whatever might be in the hotel's terms, but it seems quite doubtful that those would ban cancellation fees, since a quick search seems to reveal that non-refundable booking rates are quite common there. 11 days out is hardly unreasonable for demanding payment of a cancellation fee. 11 days is generally considered relatively short notice for most travel bookings. As others have correctly pointed out, when you reserve a room, that room is then unavailable for them to rent to someone else. If you then cancel the reservation on short notice, they might not be able to sell the room to anyone else. Cancellation fees or higher refundable rates are common ways for hotels to mitigate the risk of having rooms left empty (and, thus, generating no revenue) due to cancelled reservations. For future reference this is a tip from an experienced traveler. If you get in a jam like this about a date you can't make, instead of trying to cancel and incurring charges, you change your booking to a date far enough in the future to avoid possible cancellation charges. You thank them profusely apologizing for the inconvenience and hang up. You then call back a little later and cancel the new booking with no charge. It takes a bit of a thick skin but the hotel is not going out of business any time soon and you're the one with the cash flow problem. If their policy forbids changing a booking or adds a charge for that, stay somewhere else. The guest house is morally wrong to act in this way, I would advice you to not pay them. They may also be in violation of certain EU laws by intimidating you to pay. They can argue all they want about your legal duty to pay, but the reality is that with Oktoberfest about to start, they have already reserved your room to someone else, likely for a larger fee than the amount you originally booked it for. If the guest house persists in making legal threats, an effective way to put a stop to that is to call them and say that if they don't drop the case, you'll write your account of the situation on social media. Negative publicity is extremely costly to companies, especially small guest houses that depend a lot on booking.com for their visibility. You can safely get away with not paying, as they are unable to charge your debit card and 11 days is long enough to make their demands unreasonable. You can consider transferring funds from that debit card to another one to make sure they can't get the money even if they do get the ability to charge the debit card. But I wouldn't worry about this. Legally, the situation isn't entirely clear, because in Europe, companies do not have the right to just point to the small print to get their way. Whatever is written in the small print has to be consistent with EU customer protection laws in order to be valid, going after people because of cancellations isn't allowed. In fact, if you had made a prepayment you could have demanded your money back (within the limitations of the law), regardless of the guest house's own rules on this. The only thing you must be aware of is that companies can sometimes intimidate customers to pay by outsourcing the collection of outstanding bills to special debt collection companies that pretend to have legal rights to go after customers. In fact, in Europe they don't have any legal rights to force you to pay. They may send you bills for the requested payment plus a large sum for extra administrative costs. But you are not required to pay any such bills. To force you to pay, the company needs to get a court order and that court order can only be executed by a court bailiff, not by a private entity. But to get such a court order, the company, which by that stage will typically be a debt collection company, needs to prove that the legal conditions are met, i.e. that you were aware of the relevant details in the contract, and the contract is legally valid under EU customer protection laws. Obviously, they are not going to be able to do that. To avoid such problems in the future, it is better to book a decent hotel instead of a guest house. The small guest houses may be in a financially more precarious situation, making them hunt for every penny they can find. Reputable hotels don't treat customers this way. Many hotels have the policy that guests who were not satisfied with their stay don't have to pay, but of course, you must then make your complaints clear during the stay. This is the right attitude; they provide a services and go out of their way to satisfy the customer. The way the guest house is acting here, threating you with legal action, is the opposite of this, I would not want to stay in such a place. Not the answer you're looking for? Browse other questions tagged hotels cancellations fees-and-charges or ask your own question. If I lose my wallet can a hotel hold your luggage for collateral for not paying the cancellation fee?